Our courses are all approved with the State of Michigan as At Your Pace Online. 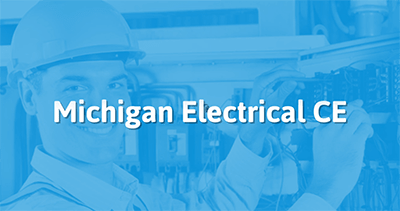 Take the continuing education to renew your Michigan electrician's license today. All of our courses can be completed At Your Pace Online to help you meet the state's requirements to maintain your license. Once you finish your class you will have an official certificate of completion to save for your records, and we will report your course completion to the state for you within 5 business days. Master, Journey, and Fire Alarm Technician electricians are required to obtain 15 hours of continuing education covering Code updates. Sign Specialists require 8 hours. The Code updates must be on the NEC version that is currently adopted by the state, which is the 2014 NEC. Our online course is approved by the state. You do not have to take a final exam in this course! Our Michigan electrical continuing education courses are done At Your Own Pace.